Back in April 2013, Quebec newspaper La Presse launched an iPad edition of the paper in Apple’s Newsstand. In 2015, after 131 years of print, La Presse discontinued its weekday print editions to go fully digital. Last December, La Presse ended its print edition altogether. At the time, their iPad edition had about 270,000 readers. Now in 2018, La Presse has reached a milestone of 1 million app downloads on iOS and Android. 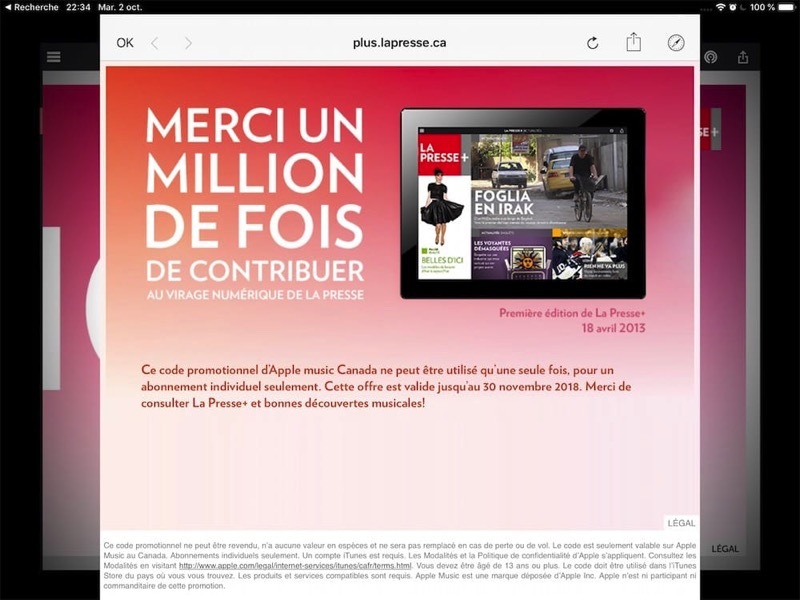 To celebrate this achievement, the digital newspaper is giving away a free month of Apple Music, which for new subscribers, means a total of four months of free music (1 month La Presse + 3 months from Apple Music). While the La Presse tablet newspaper model is proving to be successful, a similar experiment based on the publication’s technology was tried by the Toronto Star, but abandoned last June, due to low readership. Click here to download La Presse for iPad in the App Store. Are you reading La Presse for your news?